As with so many of Arcen Games’ titles, Skyward Collapse is a game that is both intriguing and genre-bending. It blends the turn-based strategy and, to a degree, 4x gameplay that’s found in the Civilization games with the “god” mechanics of the world-building aspects of Actraiser and Populous. It’s a game of unique subtlety and skill, particularly on the harder difficulties, and it is one that is constantly improving as Arcen listens to feedback from fans. Additionally, like the rest of Arcen’s titles, Skyward Collapse supports cooperative play. Unlike those titles, however, the contribution of those players to the overall goal – and in turn, the overall co-op experience – is arguable. Before any in-depth discussion of Skyward Collapse and what’s good/bad about it can begin, let’s just go through the gameplay structure. You are a “creator” that has been put in charge of overseeing the development of two opposing factions: the Norse and the Greeks. Each round, you have three actions to use for the Norse and three actions for the Greeks. These actions can vary from creating new buildings and terrain, to bestowing powerful artifacts and even summoning creatures of myth. After actions are taken for each side, there’s a phase where the factions themselves act. This means new military units will be produced and existing units will move and attack. While you’ve been able to direct the faction’s growth (to some degree) up until this point, it is during this particular phase that you have zero say in what happens. What units the factions produce, and who/what those units attack is entirely determined by the game’s AI. 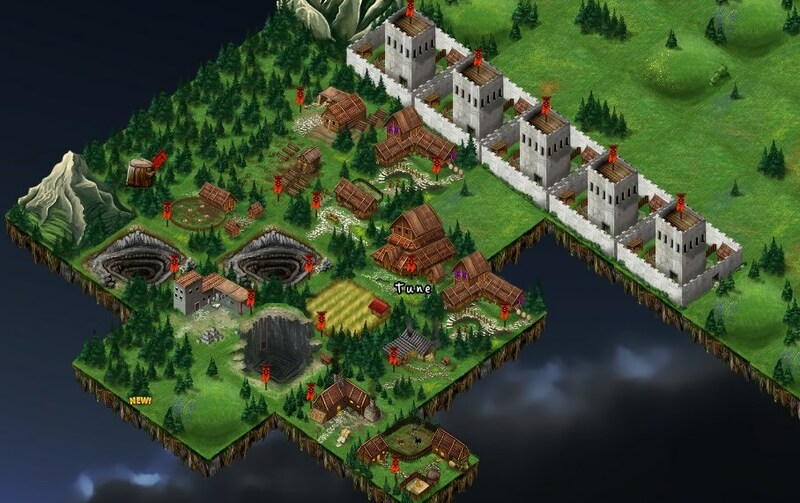 By default, these units automatically seek out the other faction’s units/buildings to attack; unless bandits – a 3rd party that’s hostile to both sides – are on the board, in which case the Norse’s and Greek’s aggression becomes focused on this new threat. Any buildings that get destroyed become ruins and cannot be built over or removed. What’s more, buildings can only be built within a certain area surrounding a central town hall, so destruction of one building may prohibit that town from building a certain unit or producing certain goods needed for other things. Expansion, then, becomes necessary to help achieve the ultimate goal in all of this: keeping the Greeks and Norse alive for 90 rounds. At this point, you may be thinking, “why don’t you just destroy the land between the factions so they can’t reach one another?” Here, then, is the final twist. You must reach a pre-determined number of points every 30 rounds, and the only thing that gets you points is allowing the two factions to kill and destroy one another. So, exactly how much rampaging do you allow before stepping in and correcting things? 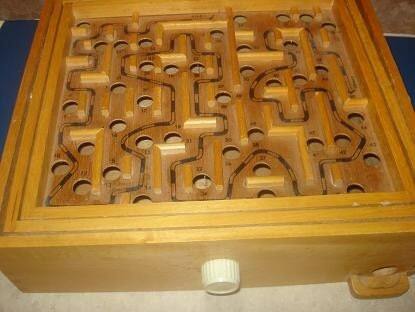 The entire game is essentially built around the same principles used in those marble maze games. When things start going too far in one direction you have to start taking actions to shift them back the other way. In the case of Skyward Collapse, these imbalances are present from the start as the Norse have weaker military units than the Greeks, but stronger mythological units (think frost giants, trolls, centaurs, and minotaurs). When you add to this the occasional bandit invasion or woe (calamitous events that range from buildings being unable to produce units for a few turns to a serial killer that kills units of a particular side), maintaining an equitable balance becomes a challenge. What all of this adds up to is a game that is as much about overcoming your own machinations as it is overcoming the “free will” of your creations. It may seem tempting to just toss a couple mythological units into the fray to help smooth things out and restore some semblance of peace, but when those creatures are the only things left and start going on a hate-filled rampage of the nearest enemy town, the actions to take may be as dramatic as the initial impulse that spawned them. Skyward Collapse is a continual lesson in the skill of small, effective changes and actions as opposed to large, dramatic ones. Achieving a fair balance between these two imbalanced factions can be tough. It is also rewarding and, like any good strategy game, extremely addictive. My first play session of the game found me falling into the “just one more turn” trap about 30 minutes into it. Before I realized it, another two hours had passed and I was staring at round 60. Building up a superior military force and stomping all over the Mongols or Egyptians (“you want my ‘The Wheel’ technology to establish peace? No deal! Deploy all stealth bombers!”) is fun, but building up both sides into a sort of forced stalemate comes with a whole different sense of satisfaction. Normally, one would think that adding friends to this mix would then increase the fun.